A few months ago we talked about the differences between a more traditional office environment and the open spaces emphasized in today’s startup world. As you can see, we don’t really take sides in this debate; it’s all about what works best for your team and your vision. This is one reason why our Gallery is full of different styles of dividers, extenders and partitions that provide the stylistic and functional touches to work in just about any office. We want to take a closer look at some of those items today to help you understand what’s possible in the space you’re designing. Choosing the right combination of products can complement the environment you want to create in your workspace and meeting rooms. Our Gallery features four different types of panels: cubicle panel extenders, desk-mounted privacy panels, split-screen panels and desk-mounted modest panels. Today we’re going to tackle two of these categories. One of the things we like to emphasize is that panels reduce noise and distractions, giving employees added privacy. The end result is employees are more productive. And we all know productivity boosts morale. Our panel extenders are a good option for offices looking to add a little extra privacy to their cubicles without the hassle of having to redo the walls on every single desk. 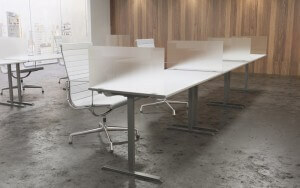 As the name indicates, these panels are extensions to existing partitions between desks. Adding them to each workstation is a simple task and the end result is well worth it. But the idea of adding extra privacy to each workspace in your office may seem a little draconian to some workers who prefer a more relational and open work environment. We get that, because we’ve learned companies are living organisms that change and adapt as time and generations come and go. 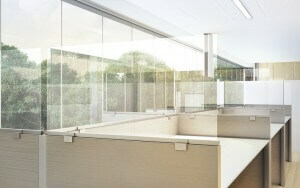 So, part of our product line includes clear extenders that do an effective job of creating privacy and sound reduction while at the same time maintaining an open workplace. We think this is a great choice for companies that want to create a sense of open space while simultaneously protecting the privacy and production of their employees. If your workforce tends to be more old-school, we’ve got plenty of solid extenders that augment the autonomy of individual workspaces. If you want a middle ground between clear and solid, our opaque extenders are an excellent choice, too. The purpose of extenders remains the same here – to reduce sound and increase privacy. But what you’ll notice in our Gallery is that our desk extenders provide all kinds of options for open and closed office areas. 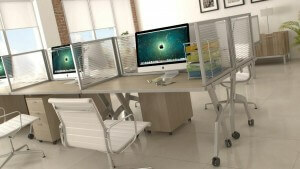 What you’ll notice is that these extenders attach directly to your desks rather than to existing partitions. This is a key distinction, because as the photos in our Gallery show, desk extenders give you a lot more open space under the desk. This setup creates a sense of unity and interconnectedness in your office, factors that are important to employees who value an open workspace. Desk-mounted extenders also give you two options for your desks: side mounts and rear mounts. Take a look at the photos on the left to get a sense of what we mean. On the one hand, you’ve got desks lined up front to back, so rear-mounted extenders provide the privacy you’re looking for. 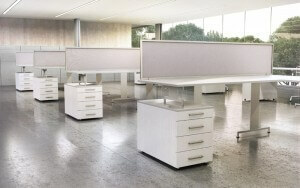 On the other hand, you can choose side-mounted extenders for desks that are lined up side-by-side. As you can see, our extenders aren’t meant to isolate but to integrate a series of side-by-side desks. In our own research of burgeoning office trends, we’ve found that this type of setup is great for companies who have small, tight-knit departments. Employees have their own defined space, but the extenders are low enough to where they can easily collaborate with team members next to them. Which extender is right for you depends on your particular situation. Head over to our Contact Us page and let us know what your plans are for the future and how your furniture and extenders play a role in that. In the meantime, stop by our Gallery to get a sense of what your office could look like with our help!